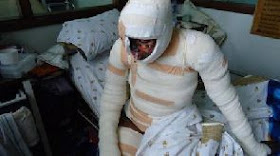 A lover’s quarrel has landed a man in trouble with the law after he poured acid on his girlfriend who had threatened to leave him. Stephen Donkor, 21, has been charged with attempted murder of his girlfriend, Mary Oforiwaa, 18. Donkor’s plea was not taken and he was remanded in police custody by the presiding Judge, Mr James Kojo Botah. Oforiwaa was not present in court because she was still receiving treatment at the Korle Bu Teaching Hospital in Ghana. The prosecution’s case was that Oforiwaa, a trader and Donkor had been in a relationship for sometime and lived in a wooden kiosk at Darkuman Cable and Wireless. The prosecutor C/Inspector Gregory Yeboah told the court that Oforiwaa had been threatening to end the relationship for some time as she suspected Donkor of cheating on her. C/Inspector Yeboah said on October 12, 2016 around 10:00p.m., Donkor came home from work but did not find food to eat. This led to a quarrel between the two, but a witness in the case intervened. Afterwards, Donkor was said to have gone for acid which he hid under the kiosk. The prosecutor said at about 1:00a.m the next day, Donkor went for the acid and poured it on the victim who was fast asleep. He said after the act, he run out of the room,while Oforiwaa woke up screaming for help, and a witness in the case went to her aid. Inspector Yeboah said while in the process of helping her, Donkor emerged, claiming some of the acid was also poured on him. Prosecutor Yeboah said Donkor together with the witness rushed Oforiwaa to the Faith Hospital and she was referred to the Korle Bu Teaching Hospital where she had been on admission. According to the prosecutor, Donkor proceeded to make a report with the Darkuman police that someone had poured acid on his girlfriend, saying he suspected the witness in the case. He said the witness was arrested, but after thorough investigations, it was revealed that it was Donkor who committed the crime.